I got a chance to drive the car to work this week a couple of times. I took the day off today, so I (of course) decided to work on the car. First up was to check and see how much oil is leaking and where. So, there is oil splatter all over the drivers side of the car inline with the crank pully. It can’t be the oil pan main seal. There’s no way that oil could get onto the crank pulley. So, it may be time to remove the timing cover, and see where the oil is coming from. 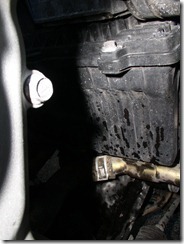 Okay, so I’ve reported previously that I’d seen oil dripping from the engine from both the front and rear of the oil pan. Today, I stopped by the auto-parts store and got 3 bottles of gunk and 3 spray cans of brake cleaner (the non-chlorinated stuff). I spent the morning spraying, scrubbing, rinsing, and repeating until it was as clean as I could get it without pulling the whole thing out. As you can see from the pix below, its pretty decent. Once I got it clean it was time to hunt for the leak. I put the whole car on stands to keep it level, and started the engine. I put the hood down, and let the engine run until the radiator fan had cycled on and off several times. I put the hood down to help build some heat and boil away any standing water. Once I got the engine hot, and the water all evaporated, I began the hunt. I found what looked like streaks under the front main seal, and on the bottom of the bell housing. Since there had been so much water, I couldn’t be sure these streaks weren’t just from oily water vibrating and dribbling down. So, I wiped these streaks away. Cylinder head gasket, passenger side, rear engine. Here are the pictures of each area. So, I have two oil leaks. I see drips just below both the front and rear main seals. They are very slow, but still present. As, I mentioned in my comment on another page: I’ve read the procedure in my two manuals (Haynes, and Enthusiast). One (Enthusiast) says exactly that for removing the oil pan. The other says that it is “possible” to do without removing the engine. of course, that procedure starts with “step 1, support the engine from above…step 2, drop the sub-frame, and jack the car.” It almost sounds like removing the engine is the easy way!!! The clutch is in need of being replaced. It works, but its still the stock clutch, and for all I know it has 190k miles on it. It was slipping when I bought it, but it stopped about 3 days after. I think the owner must have spilled oil down the clutch housing when changing the oil. I just hadn’t planned on removing the engine quite this soon. Hmmm….